Females who want the lean, defined look of a physique competitor or fitness model use Grenade's Killa Ketones. Lean glutes, flat abs and defined quads can be yours with the right and diet support. The multi award winning sports nutrition specialists at Grenade bring you Killa Ketones, specifically formulated for females. Deploying smart fat loss support ingredients including Garcinia Cambogia, Killa Ketones can assist you with your lean physique goals. Boost fat loss, manage appetite and push through to burn more fat in your workouts. You must be 18 years or older to purchase this product. Take 1 capsule on an empty stomach upon waking with water. Take 1 capsule 30 minutes prior to lunch with water. To assess tolerance consume 1 capsule for the first 7 days. Drink at least 8 glasses of water per day. Do not exceed 2 capsules per day. To open the Grenade shaped container, hold the bottle upright and gently easeoff the lid. Please note: It is not a screw top lid. Keep packaging for directions of use. Caffeine, Raspberry Fruit powder, White Kidney Bean, African Mango, CLA powder, Cape Aloes, Magnesium Bisglycinate, Green Coffee, Garcinia Cambogia Powder, Acai, L carnitine, Vit B3 (Nicotinamide), Vit B2 (Riboflavin), Vit B6 (Pyridoxine), Chromium Picolinate, Biotin, Bulking Agent (Magnesium Stearate), Gelatin Capsule (Gelatin, Colours: Iron oxides and Hydroxides, Titanium Dioxide; Glazing Agent: Shellac). Not for use by individuals under the age of 18. Consult a physician or healthcare professional before using this product if you have any medical concerns / allergies. Do not use if you are pregnant or lactating. Do not consume this product if you suffer from high blood pressure or are using any other prescribed medication. Do not consume more than 2 capsules at a time. Avoid consuming this product less than 6 hours prior to sleeping. Reduce or discontinue using this product if you feel unwell after consuming and seek medical advice. Do not consume this product in conjunction with any other product containing caffeine or other stimulants. This food supplement should not be used as a substitute for a varied diet. Contains caffeine 200mg per daily dose. Not recommended for children or pregnant women. 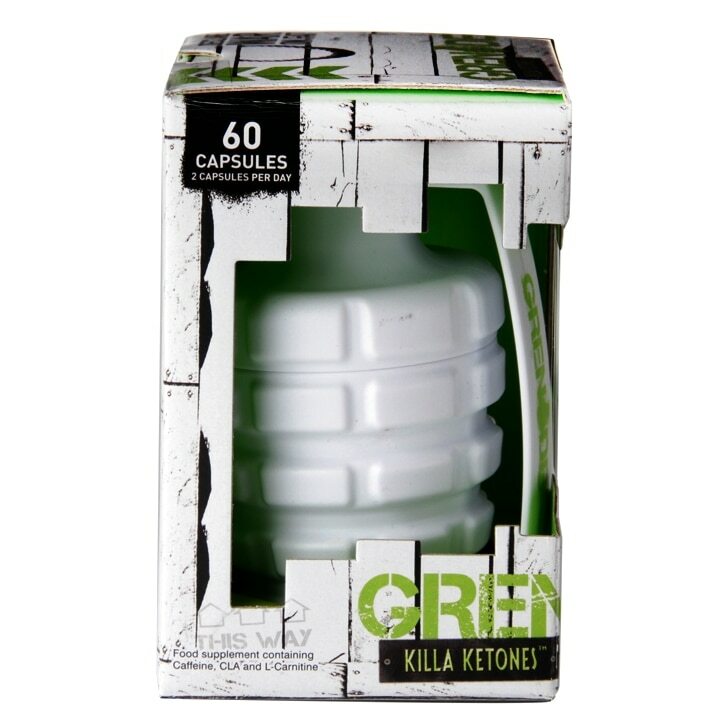 Grenade Killa Ketones is rated 4.3 out of 5 by 9. Rated 5 out of 5 by michelle69 from fantastic Great value for the money....tried so many but these really do work.